In the decades after the creation of Stow in 1683, certain boundaries, fluid, were settled, and neighboring towns gave up or took land. There are statements in historical documents that Stow at its largest was more than twice its current area of 18.1 square miles. The saga begins with Stow attempting a land grab of the vacated Indian town of Nashobah (now Littleton) in 1702. This would have added 16 square miles. The petition was rejected. Next was Stow gaining about 250 acres from Sudbury in 1730. When Stow was created, Sudbury still retained a bit of land north of the Assabet River, bordering what would become Acton in 1735. As the settlers there had no easy means to get to church or town meetings in Sudbury, they petitioned to joint Stow. The area included 200 acres that initially belonged to the Browne family. It roughly matched land now site of Maynard golf course, Christmas Motors, and Maynard's northeastern woodlands. After this, it was all subtraction, subtraction, subtraction. 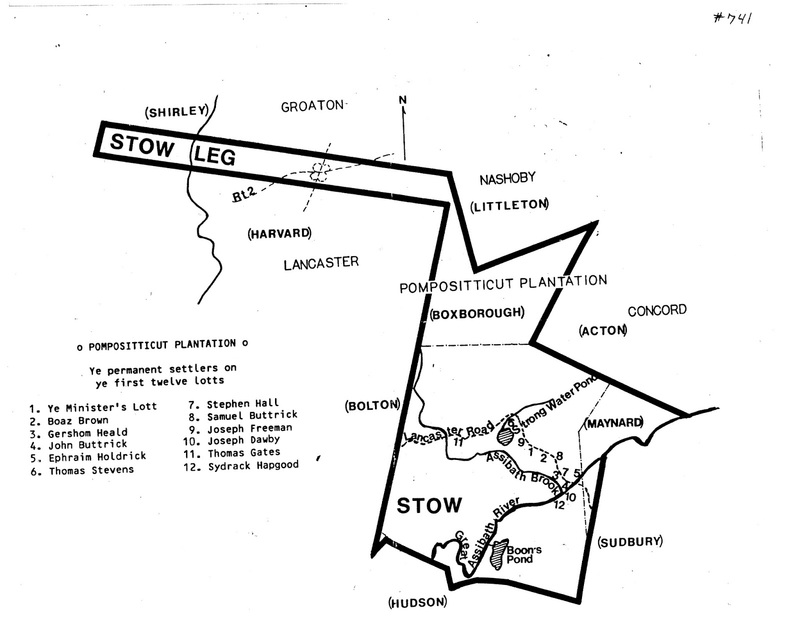 Pompositticut Plantation, renamed Stow on May 16, 1683, had been created to fill the space between the older towns and territories of Concord, Sudbury, Groton, Lancaster and Marlborough. "Pompositticut" was an Indian name said to mean “land of many hills. ” Summer Hill, Maynard, was on old maps as Pompositticut Hill. Stow included a narrow strip of land called the Stow Leg which extended miles west, to beyond the Nashua River. This came about when Lancaster and Groton were created in the 1650s. A corridor of land had been left between the two for the Native Americans of Nashobah to travel west to hunting regions. The concept was not unique - The south side of Lancaster once included land referred to as the Shrewsbury Leg. Towns changing size was not uncommon. Sudbury, established 1639, grew in 1640 and 1649, then subsequently gave up land to Framingham, Stow, Wayland and Maynard. Lancaster was as large as 112 square miles, then birthed Harvard, Bolton, Berlin, Clinton, Boylston, West Boylston, Sterling and Leominster. was created later from southwest part of Groton. Back to Stow. The creation of Harvard in June 1732 was vigorously opposed by residents of Stow, but in the end Stow lost 2,650 acres of the Stow Leg, west as far as the Nashua River. This created an oddity. 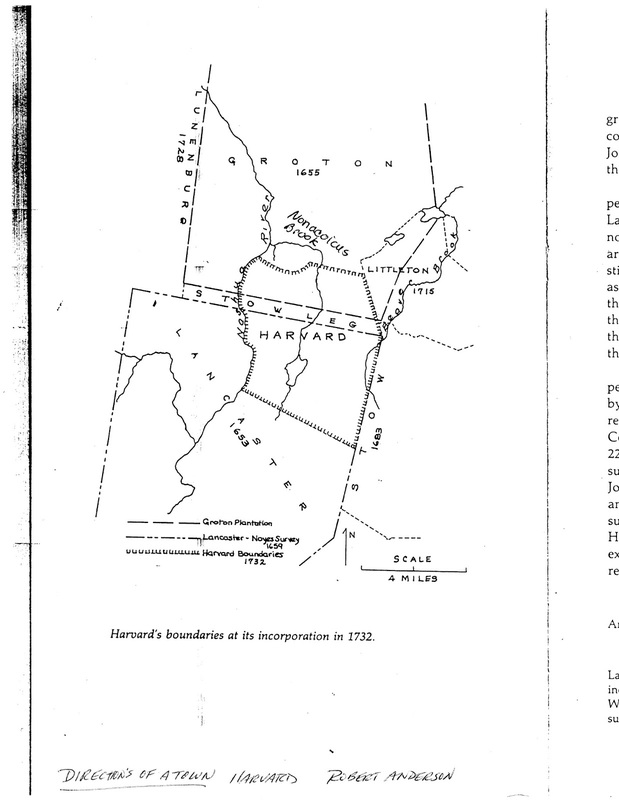 Stow Leg extended farther west than what was deeded to Harvard, so that after the creation of Harvard, Stow included an isolated chunk of land on the far side of Harvard, roughly 1.25 miles in length east to west and two hundred rods (0.625 miles) wide north to south. Problem solved 33 years later when the town of Shirley, created in 1753, formally took over this 450 acre remnant in 1765. There is physical evidence that Stow had once extended so far west. According to Ethel Childs' book, History of Stow (1983): "On the road from Shirley Center to Leominster, about 50 feet east of the Shirley-Lunenberg line is a small gully. About 125 feet up this gully one may find an old granite marker about four and one half feet high. On the top is carved the letters, 'GROTON STOW LEG OLD CORNER '." The location was visited February 2017 and the boundary marker stone still stands, although the top is so weather-worn as to be nearly illegible. The stone reads "S" and "1848" on east side and "L" on west side. According to Chandler's History of Shirley (1883), the boundary between Shirley and Lunenberg had been disputed, not settled until 1848, at which time this marker was installed. The lettering on top was historical homage to the fact that this had once been the west end of the east-west line between Groton and Stow Leg. The annexation of that Stow land by Shirley in 1765 resulted in a legal action that reached the Massachusetts Supreme Court in 1810. In those days, towns were responsible for the care of resident paupers, most commonly widowed women and orphaned children, but also men with physical or mental ailments, who were unable to care for themselves. These unfortunates could be supported in place, in their residences, taken in as town-paying borders in someone else's home, or relocated to a town's poor farm. Work was often required in return for support. Stow Leg had been until taken over by Town of Shirley in 1765. If a person or family moved into a town and the town decided the newcomers were unlikely to be able to support themselves, the town could "warn out" such persons. This did not mean eviction. Rather, it meant that the town legally absolved itself from providing future support. The case in question concerned James Bartlett, residing in Shirley. Bartlett owned land he had inherited from his father, but could not support himself. The land in question had been in that part of the Stow Leg annexed by Shirley in 1765. Shirley claimed that Bartlett's upkeep was still the responsibility of Stow. Shirley lost. The question of which town 'owned' poor was not abstract. When Maynard was created in 1871 the agreements with Stow and Sudbury were that the newly created town would assume responsibility for the relief and support of paupers within its bounds. As Sudbury already had in its care - at its Poor Farm - people who had been on land now deeded to Maynard, Maynard also agreed to pay Sudbury $300 per year for ten years for their care. 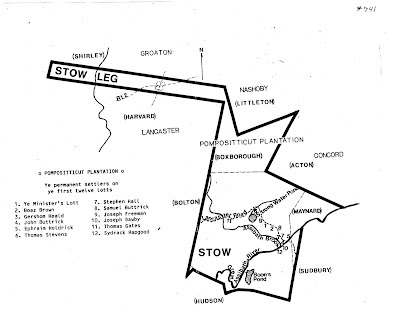 Much of the work on this topic, including the "Stow Leg" map, rests on research that Francis W. Warren, a Stow historian, conducted in 1978 for a lecture "Boundaries of Stow," some since revisited and retold by Stow historian and author, Lewis Halprin. Continued in Part Two.